Seaside towns and charming villages, endless beaches set amid green nature, secluded coves, spectacular cliffs… this is the coastline in Asturias called Costa Verde, combined with green sceneries and medieval treasures in Gijon, Aviles or Ribadeo. 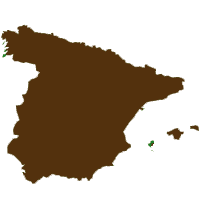 This walk is a variant of the Camino Primitivo descending to Oviedo and Lugo. For those who love Ocean and sea air. You will reach at the end of the walk as praias das Catedrais, the longest sandy beach of the coast. 2 star hotels and guest houses (casas rurales). En suite bathrooms.